If you’re anything like me, cooking for a crowd these days can seem like a daunting task. Not only is there the pressure of making something delicious and presentable, but everyone and their shelter-saved puggle seems to have some sort of special dietary requirement. Don’t get me wrong I strongly believe that everyone is entitled to make their own decisions when it comes to food without fear of judgement or criticism. And I try my darndest to support my friends as they follow their hearts and tummies, making the choices that work for them. Back to my first point, though…it isn’t always an easy task. But not to worry, I’m here to show you that there are delicious recipes out there that can accommodate even your most discriminating friends and family…I promise. Today I whipped up a lunch that was just perfect for this sunny-but-cool November afternoon. Warm and savoury, balanced out with a fresh arugula salad and some crisp fruit. This whole batch would be ideal to bring to a holiday potluck, as it would please both vegans and meat-eaters alike. Or you could always do what I did and freeze them in packages of 2 for a quick heat-and-go lunch or snack. Combine ground flax seeds with water and allow to set for around 5 minutes. In the meantime mix together cooked quinoa, seasonings and oat flour. Add flax seed “gel” and stir well to combine. 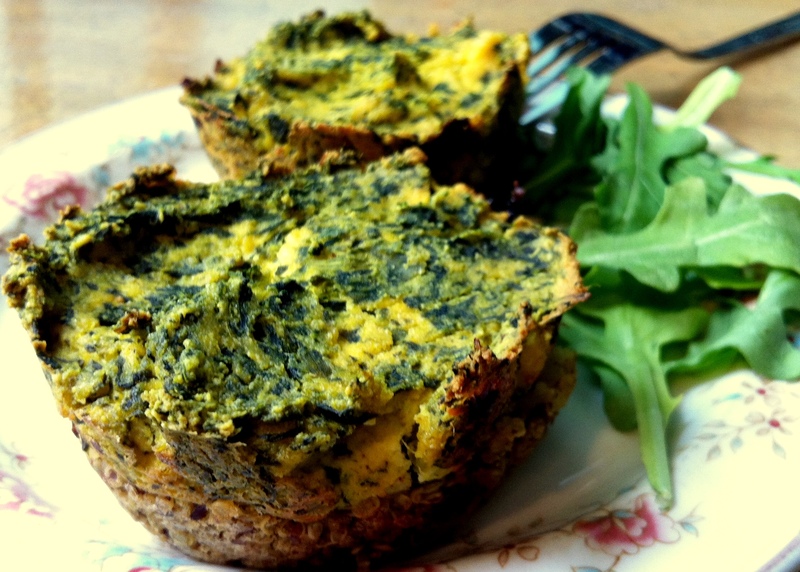 Scoop mixture into a well greased muffin tin – approximately 1 heaping tbsp per quiche – and make sure to press quinoa firmly to create a solid base. 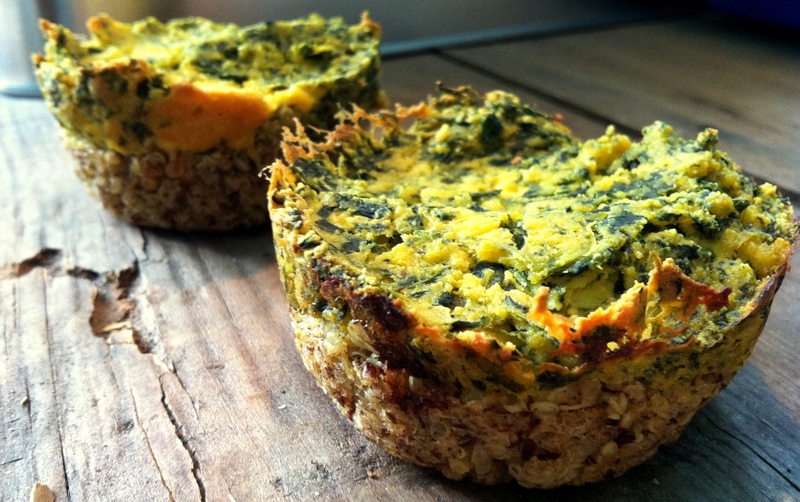 In a food processor or blend, puree all ingredients except spinach until smooth and creamy. Add spinach last and pulse a few times until well combined. Scoop quiche mixture into each base – just shy of 1/4 cup per quiche. Try your best not to eat directly from the food processor with a spoon. It will be that good. And there you have it! A fresh, hearty, inexpensive lunch you can proudly serve to just about anyone. What are your favourite recipes to cook for a crowd? Weird Ingredient Wednesday: Nutritional Yeast! Yummy – first of all, I think these look delicious. secondly, I didn’t know one could make a quinoa crust, so thanks for sharing that! You could probably make this crust with any cooked grain but I love the taste and texture of quinoa! I agree…never thought of making a quinoa crust. They look delicious. wow this looks great – will share on facebook! I like the name of your blog, and I’m excited to try this recipe! I’m going to make this for a potluck Thanksgiving where I’ll be the only vegetarian. Thanks so much for this! It was a hit. Even my picky as heck “I won’t eat anything but macaroni” step son love them! I’m stalking your blog for ideas for my restaurant … and this looks perfect! I’m saving it and gonna use it and name it after you, of course. The vegans are going to go crazy. EEE! This recipe is definitely a crowd pleaser and the crust can be swapped for anything. The base also works really well as vegan “ricotta” in pasta dishes like ravioli, stuffed shells or lasagna. Also…your RESTAURANT?! How many does this serve? I have to bring something to a potluck; there will be 30 guests. By what factor should I multiply. Quinoa crust? Genius.